This is a free-standing lace doily that I have stitched out using rayon thread. Lidia, I always enjoy your creations. You are an inspiration. That’s for sharing. Beautiful, as always. What size hoop are you using for all these gorgeous doilies? Thank you, Jo. Usually, they fit my 200x200mm (8x8") but when they are slightly larger on one side, like this one , I stitch them out in my 260x200mm (10x8") hoop. Great job my friend, absolute perfection! 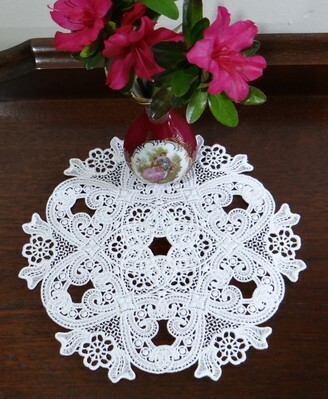 Great job I always love doilies and use them a lot. IT takes time to make them but they are so beautiful when done. Thank you, Virginia, and welcome to Cute Embroidery. Thank you, Chris. Yes, it is. The design is called 12 - Old Lace, and, you are right, I have duplicated one design six times and combined them in one go, in my software. WOW! That is awesome. How long did that take to stitch out?! WOW!!!! That's a lot of stitches.....I absolutely love these. Show us some more! You sure are the expert on doilies! I enjoy seeing this one. It looks a little different than some of your other ones. Maybe more dense? Do you do these all in one hooping? Or, stitch each part out then join them? By the way, that vase is very lovely too! Thank you, Penny. I do these all in one hooping. I have used my software to repeat and combine one design six times in a circle, to fit my hoop. I never stitch each part out and join them, my software does the layout perfectly, in one go, and it's easier to stitch the whole doily this way. Maybe the design is more dense, I never worry about the density of this kind of free-standing lace as the result is always perfect.